If there’s one thing Julie Chu has learned over her 14 seasons with the U.S. Women’s Program is that change comes with the territory. 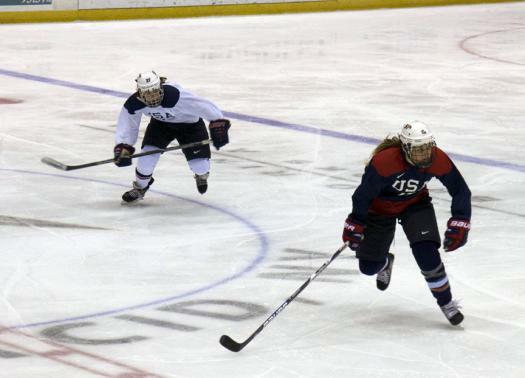 Since she first slipped on the USA sweater as a 17-year-old from Fairfield, Conn., Chu has seen the pioneers of the game give way to the next wave of rising stars. 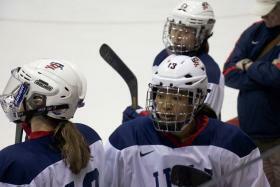 In 2005, at a similar selection camp as the one she is skating in this week in Lake Placid, N.Y., Chu was stunned when her friend and mentor Cammi Granato did not hear her name called for the U.S. Women’s Team that would represent the U.S. at the 2006 Olympic Winter Games in Torino, Italy. So many years later, Chu understands that it’s part of the game, and if USA Hockey is going to continue to be at the forefront of the growth of girls and women’s hockey, some very tough decisions are going to have to be made along the way. “I think every Olympic camp we’ve had a past Olympian that’s been cut,” Chu said while drying her shin pads in the sun outside the Herb Brooks Arena in Lake Placid, N.Y., after Thursday’s morning skate. That’s not to say that Chu is ready to relinquish her role on the team, or even the “C” that she has so proudly worn for the past several seasons. As she approaches the autumn of her career, Chu continues to work out as hard if not harder than anyone as she looks to make her fourth U.S. Women’s Olympic Team. “You can’t decide that you’re going to take two or three months off and think that what you’ve done in the past is going to be good enough. If so, there are a lot of great players who are improving and are going to take your spot. That’s why I don’t take it for granted,” said the senior member of Team USA. “Part of it is that I want to make sure that I’m at my best for my teammates. I think that by coming in here and not being my best that’s cheating them and it’s cheating our program. In addition her versatility and non-stop effort on the ice, Chu remains the leader of the squad, offering sage advice and encouragement to those who are new to the program, even though she knows that one of them may eventually take her place. “Sometimes they’ll ask questions about what do you do to prepare or little things like that. We’ll have those longer conversations at different times, and those are awesome because those are the conversations that I had with the veteran players who had experienced something that maybe gave me a little insight,” who graduated from Harvard University with a degree in Psychology in 2007. 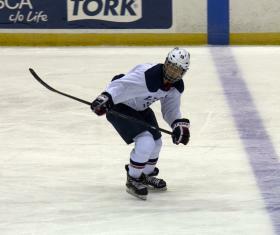 To prove her dedication to the sport, Chu continues to log thousands of miles every year as she works as an assistant coach with the Union College women’s program in addition to competing for the Montreal Stars of the Canadian Women’s Hockey League, all while continuing to live and train in Boston. “We always put on a lot of miles but I think that’s the life of a hockey person, whether you’re a player or a parent you definitely log a lot of miles. But we love what we do and I like to drive so it doesn’t bother me,” said Chu, who played her youth hockey in the Connecticut Polar Bears organization. “I’ve been fortunate to have the environments where I was able to train. At Union I had a full-time job but I was also practicing and training while I was doing that. There were some longer days but I think the balance of what I could get out of that was really great.